'Fantastic Beasts: The Crimes of Grindelwald': Is a romance with Nagini the reason Ezra Miller's Credence was kept alive? On the brink of the release of this year's pivotal Harry Potter franchise film, 'Fantastic Beasts: The Crimes of Grindelwald' (Fantastic Beasts 2), here's one thing we know for sure - regardless of what fate might have in store for Ezra Miller's character, Credence Barebone, it's a guarantee that he, in all his Obscurial glory, has survived the end of the first movie, aka 'Fantastic Beasts and Where to Find Them' (Fantastic Beasts 1). But that wasn't always the case, right? At the end of 'Fantastic Beasts 1', fans were left really confused about the fate of the character - so much that certain fan theories insisted it was the end for Credence. But here in 'Fantastic Beasts 2', he is alive and waging a rebellion with his other magical accomplices, a certain Nagini playing an active role in all of that too. And that brings us to the burning question - Was Credence kept alive only for a prospective romance with Nagini? Okay, hear us out - it's not that far-fetched a concept, come to think of it. There are similarities between both their plotlines, revealed author J.K. Rowling herself, that just helps tie up the elaborate plot's possible loose ends. Credence Barebone was the New York raised adopted child of Mary Lou Barebone, and throughout his childhood was forced to keep his magical powers hidden - hence turning him into an Obscurial, sort of like a host for dark, parasitical magic powers. Nagini, on the other hand, was a Maledictus - a curse carried by blood where women in the family are cursed to shapeshift into an animal, whose form they end up taking permanently, eventually. Trailers and teasers released so far have established Nagini used to work with a circus troupe where people paid to watch her shapeshift, but nobody acknowledged it as magic, not the positive kind, definitely. As is clear by the recent revelation of Nagini's true identity, despite fans having known her in the form of Voldemort's most beloved pet snake all these years, this whole Nagini being a human female was a very late development. Quite possibly after it was confirmed Credence/Obscurial is, in fact, alive post the incidents of 'Fantastic Beasts 1', and despite the author claiming she had framed this plot for the snake long ago, fans are having a hard time digesting that basically, she was a woman of color disguised as a white dictator's pet all along. 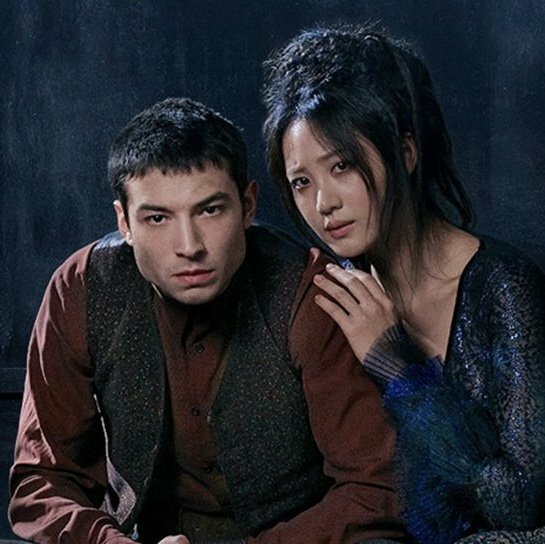 Ezra Miller as Credence Barebone (L) and Claudia Kim as Nagini (R) in Fantastic Beasts: The Crimes of Grindelwald. Source: Twitter. But all of that aside, what it does boil down to is that Nagini - in her human form - was held in captivity under the pretext of her own safety. Kind of like Credence, whose adoptive mother had him convinced that his powers were to be abhorred and repressed because nothing good could ever come out of them. It seems convenient right now that a romance should brew between the two. A lot of fans have raised their concerns about an Asian woman playing the human role of Nagini (Claudia Kim) and how racist all of that seems. That aside, it merits pointing out that maybe the whole Nagini is human subplot was created entirely to spin a romance plot for Credence. They are both magical humans who have been raised and held captive for their powers, and coincidentally, he's the one who helps her escape the humdrum of the circus with promises of a future where they are free. So, in a way, they're interlinked - Credence was possibly kept alive, and Nagini was announced to be a human just so they could find each other and pursue their feelings.